I was recently contacted by Joules and asked whether Leo and I would like to review some of their very lovely clothes. Of course I was very quick to accept, it is not very often that anything comes for review purposes that is not for the little man. So the thought of something for ME was just what I needed. I had a look around the website at the beautiful new Spring and Summer lines. There was lot’s of choice and so many colours to choose from. It was really hard to narrow it down to just one item, but I eventually set my sights on a stripey White and Navy Jersey top that I thought would be perfect for the office. It looked the perfect length to be able to pair it with either leggings or tights and of course my boots for work, and when it arrived I soon discovered that I had been right. The length of this top falls to knee length and so would be perfect to wear as a dress in the summer days that I am hoping lie not too far ahead. The full lenth sleeves have been great in this cooler weather we have been experiencing over the past few weeks, but would still be fine in warmer weather due to the breathable material. (95% Viscose, 5% Elastane). I have this top in a size 8 and it fits perfectly, there are flattering pleats on the front and it is just really comfortable to wear. This top has been washed on multiple times now and has still maintained it’s shape and colour. I find how clothes wash an important factor as I am often left frustrated when you have spent a small fortune on an item only to have the design fade in the wash or for it to become miss-shapen. I love that this top can be dressed up or down and it is an item of clothing that I’ll be keeping in my wardrobe for some time. 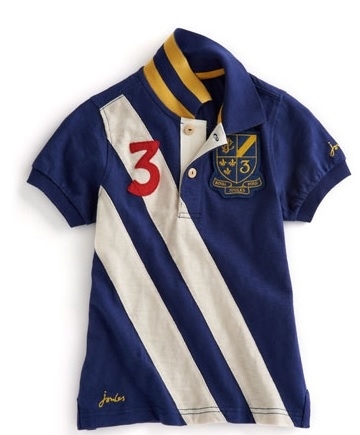 The children’s boys clothing features lot’s of choice, and after I had a look at everything I picked out a very smart rugby shirt for Leo. I am just as impressed with the quality as I was with my top. 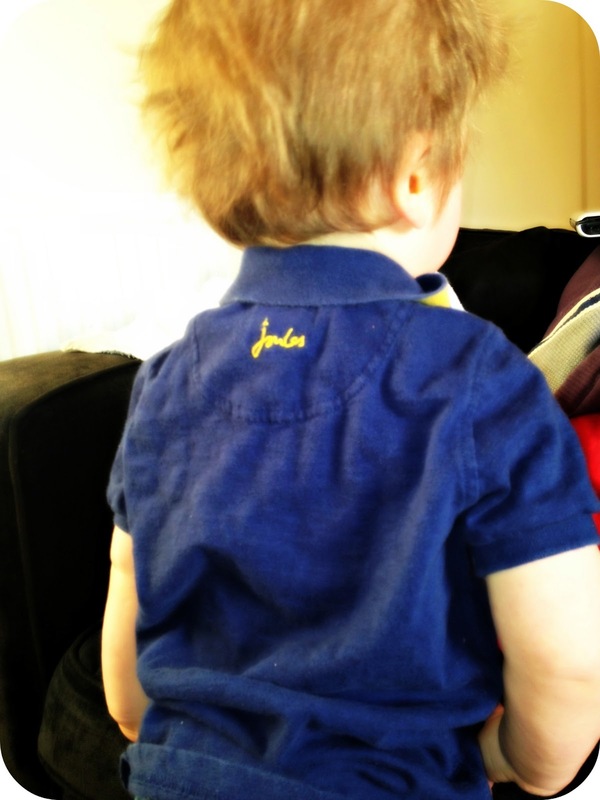 I knew that Luke was going to like Leo’s new shirt so I dressed Leo in it to see what he had to say. First Luke was impressed that Leo was sporting a rugby top (Luke is a big rugby fan) and secondly he was admiring all of the authentic details that have gone into the top. There is a player number and a badge donned with the Joules logo. Over all it is just a lovely little top, one that is set to last Leo for some time to come. I ordered it in a size 2-3 years as I wanted Leo to get lots of wear out of it. Little man turns 2 in June this year, and besides it being a little longer he can very easily get away with wearing it. The Joules range is such a lovely collection and has some lovely lines, from the quilted jackets that are perfect for Spring time to keep off the chill to the bright Summer dresses. Disclaimer: I was sent samples from the Joules range for the purpose of this review, however all views and opinions are completely honest and my own.